Home Chronic Pain What Is Rheumatoid Arthritis? What is rheumatoid arthritis exactly? How do you manage it if you’re diagnosed? There are many different types of conditions that can cause chronic pain. Rheumatoid arthritis (RA) is certainly a challenging one. As one of the many types of arthritis, it can cause joint pain, swelling and stiffness. But what is rheumatoid arthritis exactly? How do you manage it if you’re diagnosed? Understanding the symptoms, causes and management techniques of RA can help you to live a more fulfilling life with this disease. Rheumatoid arthritis (RA) is an autoimmune disease that causes the body’s immune system to mistakenly attack your joints. Typically, your body attacks foreign bacteria and viruses. But when you have RA, your body causes inflammation in your joints, resulting in both swelling and pain. Rheumatoid arthritis is different than osteoarthritis. Generally, osteoarthritis occurs because of wear and tear damage to joints. Rheumatoid arthritis, on the other hand, affects the lining (tissue) of your joints. 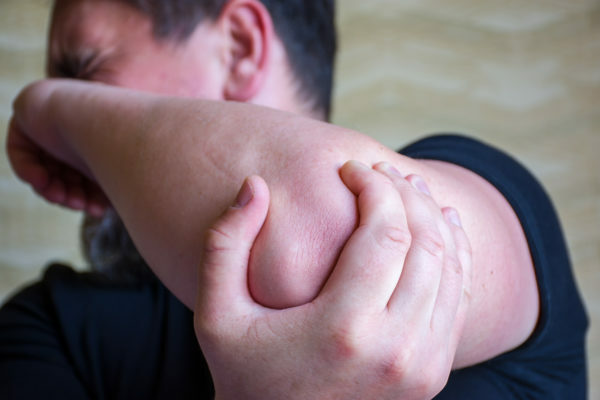 The pain you experience is a result of inflammation rather than joint wear and tear. Typically, early stages of rheumatoid arthritis affect smaller joints. This includes the joints in your hands and feet. As RA progresses, it may also affect larger joints such as elbows, wrists, knees, hips and shoulders. In addition to the symptoms above, you may experience a loss of appetite and fatigue. You may even develop a low fever. Rheumatoid arthritis symptoms can come and go. When you experience a period of increased inflammation and other symptoms, you are said to be experiencing a “flare.” Flares can last for days or even months at a time. Keep in mind that RA is a systemic autoimmune disease. This means that it often affects the entire body. For many people, RA affects more than just their joints. As with any condition, RA affects people differently and at varying levels of severity. What are the long-term effects of rheumatoid arthritis? It’s important to treat RA promptly, as inflammation can cause damage if left untreated. Chronic inflammation from RA can damage the cartilage that covers the ends of the bones in your joints. This inflammation can cause a loss of cartilage, and gradually the space between your bones in your joints can become smaller. As your joints are altered, they can become loose, painful, and unstable. You may experience reduced joint mobility and joint deformity. This damage to your joints is permanent, so it’s important to find a doctor who will aggressively treat rheumatoid arthritis. Paige Cerulli majored in English and music performance. She has since developed a career as a content writer and copywriter. She often writes on a health, wellness and chronic illness topics, and her work has appeared on multiple popular websites. Paige lives in Western Massachusetts where she shares her life with a number of horses, cats and ducks.